Uwishunu is a fantastic resource that I use all the time to see what’s going on. The weekend guide will be especially helpful to see the top events for Friday, Saturday and Sunday. It also has the option to look up events by date or neighborhood. Visit Philly shows events and attractions from Philadelphia and the Countryside. This website lets you know what all the top attractions are from the Mutter Museum to Rittenhouse Square to the Liberty Bell Center. Philly Fun Guide offers lists of events from theatre to music to the outdoors and even has a tab that provides a listing of free events! Celebrate American Archives Month by voting for the item from William & Mary’s Swem’s Special Collections you find most interesting. During the month of October, items selected from Special Collections will be competing for the public’s vote. You will have to choose between letters, scrapbooks, diaries, rare books, memorabilia and artifacts. Voting is open to anyone and will be conducted both on-site and online. Individuals may vote once online (at Facebook or Flickr) and once on-site. Voting will end on Monday, October 28 at 3 p.m. One winner will be selected from online and one from on-site voters. A grand prize student winner will also be selected. Winners will receive Swem Library gift packages, including sticky notes, pencils, a t-shirt and other “Swemorabilia”. The grand prize student winner will receive a personal behind the scenes tour of Special Collections for up to 5 friends, coffee at the Mews and a Swem Library gift package. American Archives Month is a collaborative effort by professional organizations and repositories around the nation to highlight the importance of records of enduring value. Archivists are professionals who assess, collect, organize, preserve, maintain control of, and provide access to information that has lasting value, and they help people find and understand the information they need in those records. For more information about Swem Library and its collections, please visit http://swem.wm.edu/. In 1884, a working-class printer with little education named Charles M. Davies asked Russell Conwell, pastor of Grace Baptist Church in North Philadelphia, to tutor him at night. One pupil quickly became several, and Conwell soon recruited other volunteer teachers and moved classes to the basement of his church. The night classes grew quickly in size, and in 1888 Temple College was chartered and incorporated, “intended primarily for the benefit of Working Men.” The congregation of Conwell’s church grew rapidly as well under Conwell’s leadership, leading to the construction of a new church building known as the “Baptist Temple.” Its founding location continues to serve as Temple’s main campus—located approximately two miles north of Center City Philadelphia. Temple University along Broad Street. Photo by author. From these beginnings grew Temple University as it exists today: a major coeducational research university that includes seventeen schools and colleges, nine campuses in three countries, hundreds of degree programs including schools of law, medicine, and business, and more than 35,000 students. 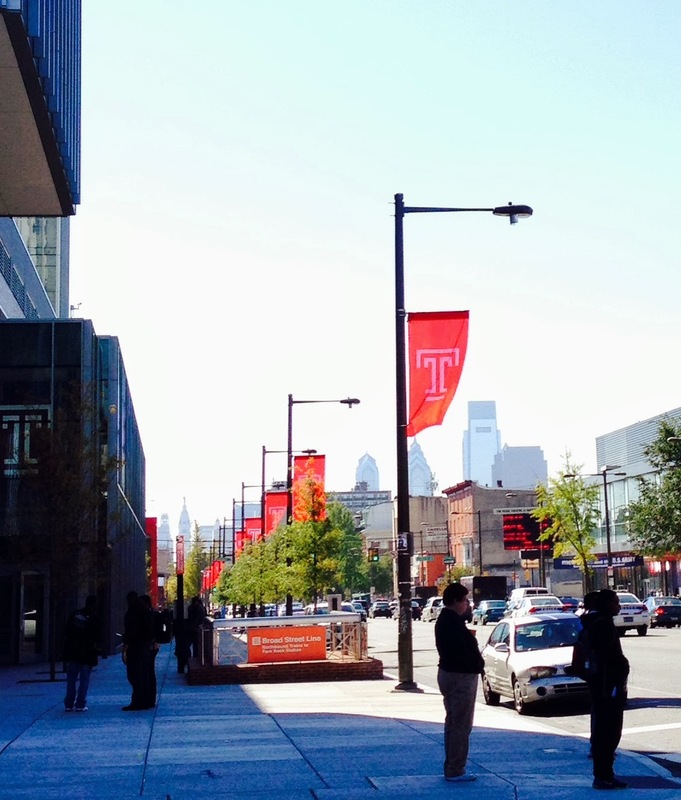 Temple has been recognized as one of the most diverse universities in the country. Temple University Libraries serves the university’s many schools and campuses, ranks among the top university research libraries in North America, and is a member of the Association of Research Libraries. 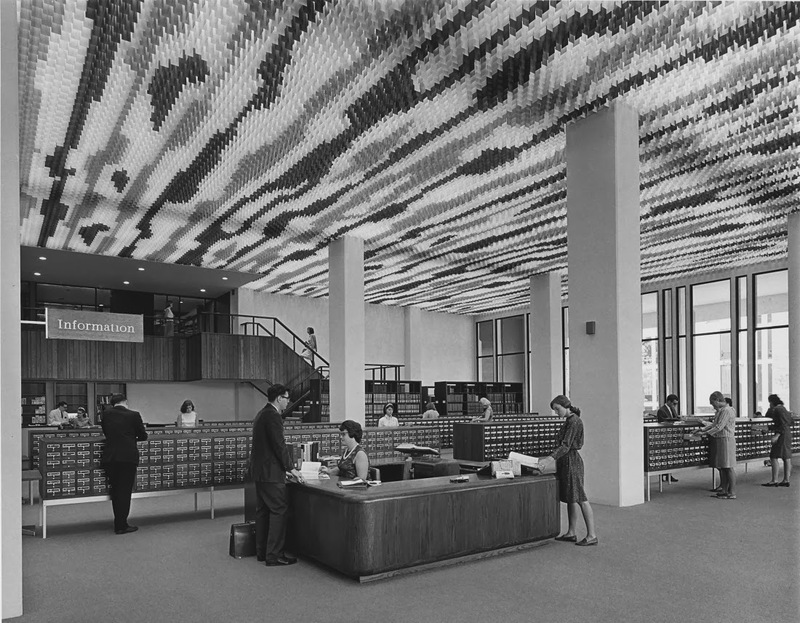 Samuel L. Paley Library, 1966. Special Collections Research Center, Temple University. Temple’s history and mission can be found within the university traditions and on the campus itself. The Baptist Temple still stands, and currently serves as the Temple Performing Arts Center. Russell Conwell himself is buried on campus (perhaps peacefully, perhaps not) in the Founder’s Garden. The university motto, Perseverantia Vincit, or “Perseverance Conquers” reflects Temple’s origins as a night school for motivated students, as does its mascot, the nocturnal owl. The Temple “T,” symbol of the university, was designed by a student in the Tyler School of Art, and features open ends intended to represent the free exchange of ideas. The main campus is urban, eclectic, and always alive and busy – a compact space for an enormous community of students, faculty, and staff. Food trucks line every block, and on a fair weather day, students can be found spread out on “Beury beach,” a rare spot of green grass near the Bell Tower and opposite from Paley Library. Paley itself is a monument of 1960s-era architecture. Other notable buildings on the main campus include the new Tyler School of Art, the Gothic Mitten Hall, and Sullivan Hall, former home of the main university library, and current location of the Charles L. Blockson Afro-American Collection. Within Paley Library, the Special Collections Research Center collects, preserves, and makes accessible the Libraries’ rare books, manuscripts, archives, and University records, to support research, teaching, learning, and administration at the university. The SCRC was established in 2011, merging the staff and collections of the former Special Collections and Urban Archives departments. Like the university, SCRC collections are large and diverse. Collecting areas include the Contemporary Culture Collection, Conwellana-Templana (University Archives), the Paskow Science Fiction and Fantasy Collection, the Philadelphia Dance Collection, the Philadelphia Jewish Archives, Printing, Publishing, and Bookselling, rare books, and the Urban Archives. Recent estimates of the size of SCRC’s collections weigh in at a hefty 60,000 linear feet of archives and manuscript collections, and around 200,000 rare books. 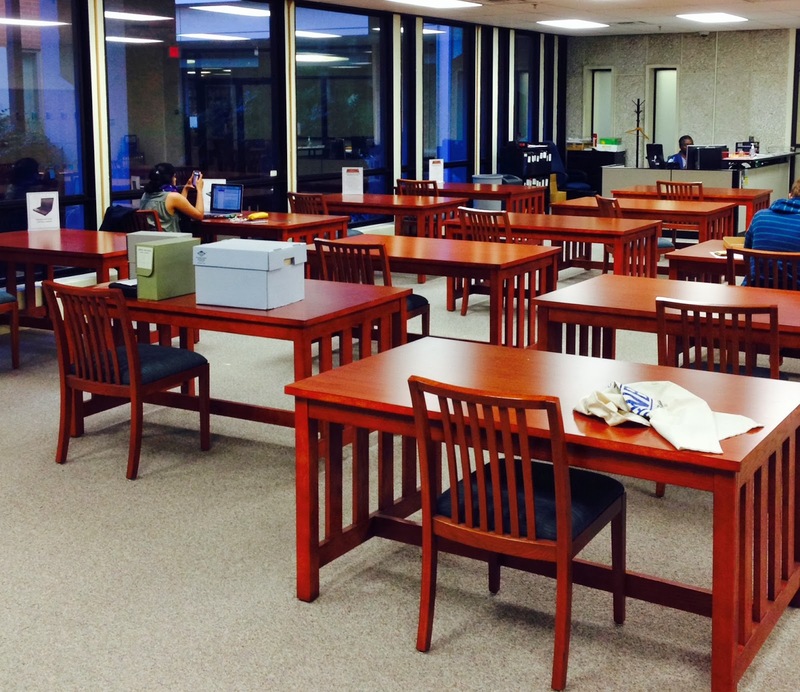 The SCRC reading room is open to all during the regular hours of Monday-Friday, 8:30-5:30. Special Collections Research Center reading room. Photo by author. MARAC is offering a tour of the Special Collections Research Center on Thursday morning, November 7. The behind the scenes tour will include the reading room, storage areas, and the current exhibition featuring significant acquisitions from 1966 to the present. After the tour there will be plenty of time to walk around the campus, eat at the nearby food trucks for lunch, or visit the Blockson Collection or the Wagner Free Institute of Science, a Victorian natural science and history museum and educational institution located a half mile away. The tour is not yet filled, so be sure to register for the tour when you register for the conference (registrations will be accepted until October 23). If you have already registered for the conference, you can still sign up for the tour by contacting the MARAC administrator. Registrations will also be accepted on-site at the conference as space allows. Items from the Special Collections Research Center. Photo by author. Benjamin Franklin is surely one of the names most closely associated with Philadelphia’s past and his presence is very visible around the city today. For those of you who sign up for a tour of the American Philosophical Society, you will see a statue of Ben Franklin looming over the entrance. Franklin founded APS in 1743, but 12 years earlier he established the Library Company of Philadelphia (1314 Locust Street) whose building is also adorned with a Franklin statue. For those who want to venture even further from the hotel, keep going west to the Franklin Institute on the Parkway. Although not founded by Franklin, the institution’s mission is to inspire a passion for learning about science and technology, certainly something that would have pleased Benjamin. Crossing over the Schuylkill River into West Philadelphia takes you to the University of Pennsylvania (yet another institution founded by Franklin) and featuring a handsome statue of Franklin in front of College Hall. The less adventuresome or those with less free time can find plenty of opportunities to see Franklin close by the hotel in Old City. The Benjamin Franklin Museum located at Franklin Court with entrances on Market and Chestnut Streets between 3rd and 4th Streets, just opened in the fall and is located in close proximity to the Franklin Post Office and Franklin Printing Office. Only about a block away is Franklin’s final resting site in the graveyard of Christ Church. As you wander about the Old City and National Independence Historic Park area, be sure to keep an eye out for Benjamin Franklin, himself, as portrayed by an actor in historic garb. From bridges to elementary schools to plumbers to apartment buildings, it is not hard to find something with the name Franklin attached to it, but the one business you must check out is the Franklin Fountain at 116 Market Street and treat yourself to some delicious ice cream. MARAC in Philadelphia: Where Can I Get a Drink In This Town? Philadelphia is known as a “city of neighborhoods.” If you’re thinking of venturing out in the evening, the reality of that moniker might overwhelm you. Each Philadelphia neighborhood has a truly unique character. If you haven’t visited us for a while, you will find the restaurant and bar scene has exploded over the past decade. Here’s a guide to help you find a nice place to relax and have fun while you’re in town. Consider it as a “choose your own adventure” tour of some of the many bars our city has to offer. Don’t forget, bars in Philadelphia close at 2am! Do you want something scenic and convenient? Choose the bar in the conference hotel! Keatings River Grill in the Hyatt at Penn’s Landing has happy hour specials Monday – Friday from 5pm to 7pm. Prices ($3 draft beers and $4 house wines) are extremely reasonable for a hotel bar, especially one that overlooks the Delaware River! Do you want to take a short walk? Head over to Old City! Right on the other side of Columbus Boulevard is Old City, the Philadelphia historic district. This area is well known for the Liberty Bell, the Betsy Ross House, the Constitution Center and much more. It is also the neighborhood with the highest concentration of bars, restaurants and clubs in the city. You may like this area if you are looking to try out a few different options. Bear in mind, most of the places in Old City a relatively small. The happy hour crowd in Old City is typically professionals coming from work and a little bit of the tourist crowd. At night, especially Thursday through Saturday, the vibe is a bit more youthful. The clubs in this area tend to open around 10 or 11pm and things can get rowdy late at night. There are many options to choose from in Old City, so where do you want to go? Looking for a huge beer selection? Choose Eulogy! Eulogy, at 136 Chestnut Street can be easily reached by foot from the Hyatt via the Chestnut Street Bridge. You’ll find that this Belgian tavern has hundreds of beers for you to choose from. The space is small, but Thursdays through Sundays a second bar is open upstairs. Looking for a fancy cocktail? Choose the Continental! You’ll find the diner-style martini bar on the corner of 2nd and Market Streets. A classic spot for fun drinks and people watching, this bar is a long time Old City staple. It’s not recommended for large groups, but perfect for couples and trios! Looking for a classic cocktail? Choose Sassafras! This bar on 2nd Street, between Market and Chestnut Streets has terrific atmosphere– very mellow, excellent lighting, and classic drinks. Good for a medium sized group. Also a great spot for loners! TVs at the bar, and good old fashioned friendly bartenders to keep you company as you unwind. Looking for a fun bar with a friendly environment? Choose Mac’s Tavern! At 226 Market Street, Mac’s is the closest thing to a true “Philadelphia bar experience” that you will get in Old City. This is the old Skinner’s Tavern, now owned by Rob and Kaitlin McElhenney, of It’s Always Sunny in Philadelphia fame. You’ll find a good selection of cheap beer, a sports loving crowd, some hipsters, and ample seating. Looking for that true Philadelphia bar experience? Time to head off into Center City! Sure, this is a pretty subjective concept, but as a life-long resident of the Philadelphia area (who worked in the hospitality industry for over six years) I think I can offer some insight into what an authentic Philadelphia bar is… but the truth is, it is not one single type of place. One street in Center City seems to capture it all: Sansom Street. Sansom is a small, alley-like street between Walnut and Chestnut Streets. Catch a cab “downtown” to 16th and Sansom Streets and head to the Oyster House for buck-a-shuck oysters and $5 martinis from 5 to 7 pm. Get yourself a seat at the bar. Two doors over you’ll find Oscar’s Tavern. Oscar’s doesn’t have a website, but do yourself a favor and skip the Yelp reviews about it. If you like dive bars, you will like Oscar’s! Looking for an Irish bar? Head down over Broad Street to Fergie’s Pub at 1214 Sansom. You’ll find a classic pub environment with friendly service. Get there before 9pm on Thursday night and sign up for Quizzo! The good thing about this general area is that there are a lot of fun options; but if you’re exploring, don’t bother heading north of Chestnut Street because that’s the business district. Feeling stylish? Head over to Rittenhouse Square! On 18th Street between Chestnut and Locust Streets you’ll find a number of fun bistros and cocktail lounges with a classy feel. Check out Rouge for a view of the park. Step down into the Franklin Mortgage & Investment Co and find a speakeasy-style bar with creative cocktails. Walk over to 20th and Sansom and check out the bar at Village Whiskey for fancy drinks and great food! There are countless places around the city to have a good time. Most of the above options are walkable from the conference hotel, or centrally located in areas frequented by cabs. 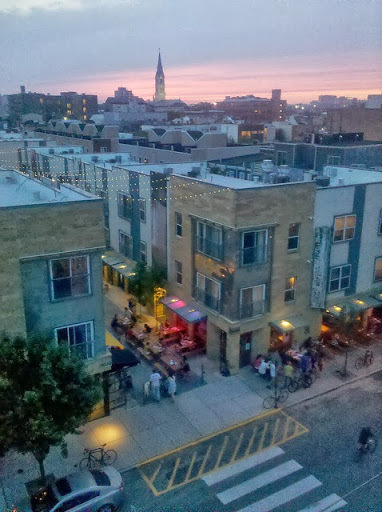 There are a lot of fun bars in the Northern Liberties and East Passyunk neighborhoods as well. If you find a place that you’re interested in that’s off the beaten path, grab a cab there, but make sure to get the phone number for that taxi service! You will find it hard to find a return cab in some of these areas. In my experience, you will usually pay no more than $10 to some of the more remote nightlife locations. Have fun, but be safe, and never drink and drive. If you’re planning to join our tour of the Barnes Foundation on Thursday, November 7, you may want to consider spending the morning in the neighborhood, Logan Circle (or Logan Square). The square was once used for public executions in the 1700s but it has changed dramatically since then! Today, Logan Circle is home to the Academy of Natural Sciences, Moore College of Art and Design, the Franklin Institute, the Free Library of Philadelphia, and the Cathedral of Saints Peter and Paul. The Circle is bounded on the west by 20th Street and the Barnes Foundation’s new building is located between 20th and 21st Streets. Why is the Academy of Natural Sciences of Drexel University the coolest place on Logan Circle? Because they have dinosaurs! Not just old bones stuck together with glue but life-sized moving dinosaurs in the exhibition, “Dinosaurs Unearthed.” AND they have a butterfly garden. Magical. The academy is open from 10AM – 4:30. Admission is $15.00. Moore College of Art will open two new art exhibitions this month that run through the end of the year. “Retulled: Selections from Jumpstart,” presented in conjunction with the Pennsylvania Ballet’s 50th anniversary,” features ballet tutus designed by the students, and the “2013 Triennial Faculty Exhibition.” The galleries are open from 11AM – 5PM, admission is FREE. The Franklin Institute has a giant heart. Really. You can walk through it! When I was a kid, I loved this exhibit! The institute also has an IMAX dome theatre which spans 180 degrees across and is tilted at 30 degrees. “The special seating places the audience up in the dome completely involving them in the show.” The institute is open from 9:30AM – 5PM. Admission is $16.50, and the theatre is an additional $6.00. Our neighbor, the Free Library of Philadelphia, has two interesting offerings on November 7 when MARAC is in town. 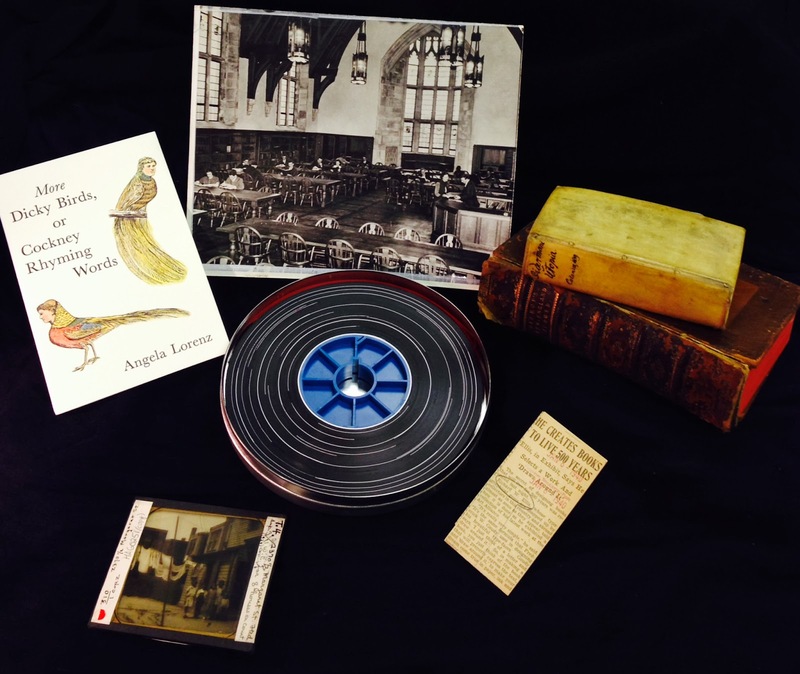 First, an exhibition presented by the Rare Book Department entitled, “Of Money and Magic: The Industry and Artistry of Early American Film,” and also a lecture by Katrina van Grouw, a natural history illustrator and author of The Unfeathered Bird. The library is open from 9AM – 6PM. The author lecture is FREE and begins at 7:30PM. The Cathedral Basilica of Saints Peter and Paul, whose main sanctuary comfortably holds 2,000 worshippers, is the largest Roman Catholic church in Pennsylvania and the head of the Archdiocese of Philadelphia. Don’t be deceived by its drab brownstone façade. The dome seen from its interior is really breath-taking. Our other neighbor, the Rodin Museum, claims that it is “one of the most revered destinations on the Benjamin Franklin Parkway.” (I guess the Barnes is still too new to be “revered” but just wait!) This beautiful building, recently restored, was created by Paul Philippe Cret, the same Beaux-Arts architect that Dr. Barnes hired in 1922 to design our original building. The museum is open from 10AM – 5PM. Suggested admission is $8.00. Newly opened in September, Pizzeria Vetri offers the usual pizzeria fare of pizzas and salads. At 1939 Callowhill Street, it is just one block east of the Foundation. McCrossen’s Tavern is a tiny gastropub, slightly north of the Foundation at 529 N 20th Street. They usually have yummy specials like brandade and bone marrow. The Belgian Cafe is an excellent spot for craft beer and mussels. Only a short two block walk north at 21st and Green street. Sabrina’s Cafe is a popular brunch spot that also serves lunch and dinner and is a favorite of the Archives, Libraries and Special Collections department at the Barnes Foundation. It has large portions of amazing diner classics as well as specials you can’t get anywhere else. 1804 Callowhill Street. Doma is a great spot if you are craving sushi. 1822 Callowhill Street. If you are more in the mood for Indian, King of Tandoor is one of my favorites in the city. 1824 Callowhill Street. Kite and Key has great bar with many beers on draft or by the bottle. They serve up great flatbread pizzas and sandwiches. 1836 Callowhill Street. Cheverly, MD (not College Park, MD) – October 8: Greetings fellow MARAC Members. As I write this, we are in day 7 of the government shutdown, and I, like many of my MARAC colleagues have been furloughed for the past week. I wanted to reach out to everyone to let people know that while many of us have been away from the office – MARAC is still on the job and preparing for our meeting in Philadelphia in one month’s time. Tammy Hoffman, our MARAC Administrator, let me know the other day that as of the early bird deadline – there were over 300 registrations for the meeting, which will take place on November 7-9. We have also exhausted our room block at the conference hotel – but MARAC Vice Chair Mary Mannix is hard at work finding additional hotel rooms for those looking for a place to stay in the City of Brotherly Love. I sincerely hope that all of you who are affected by the shutdown are faring well. I have been spending my time doing some “home” work (I read a colleague’s Facebook post where she referred to her “shutdown to-do” list left by her husband) and performing some records management for other organizations in which I serve. I am also picking up my boys at the end of their school day, rather than them staying for aftercare – so I am getting back to my teaching roots with homework in the late afternoon. MARAC is an organization with so many of us working in government, I am sure we all have stories to tell. Please feel free to send your “shutdown stories” to me or directly to MARAC and we can post some of them here on the MARAC blog! I look forward to seeing many of you in Philadelphia in November!